I was looking for Chest Exercises on the internet, and I couldn’t believe how many posts I found related to chest injuries sustained from weight lifting. For example, one bodybuilder reported that he had torn his left pectoral muscle while attempting to bench press 415 pounds. He did not need surgery as the injury was only a partial tear. Nonetheless, the injury was permanent and would forever affect his training. For the rest of his life, there would always be an empty space on his chest where tendons and muscle used to be. Another bodybuilder reported that he had suffered a serious shoulder injury from performing an incline dumbbell press. Although he felt like it might be an issue with his rotator cuff, he wasn’t sure. The only thing he was sure of was that it caused him tremendous pain when he tried to perform a bench press. Is Weight Lifting really Healthy? The common thread with these posts and the others I read are that you had people who, I presume, wanted to get bigger and stronger. However, the exercises they did to accomplish this goal caused them to sustain severe injuries. If you perform a particular exercise to get healthier, yet it causes you injury, how healthy is it really? Does it make sense for you to do them too? The problem with the chest exercises that these bodybuilders were performing is that they are unnatural movements for the human body. 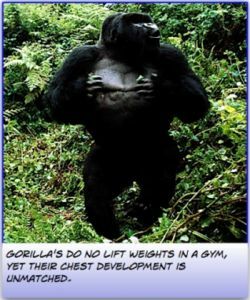 Man evolved in nature using his own bodyweight to stay in shape, not lifting weights repeatedly in a gym. Think about a basic exercise like the bench press. When you are performing this exercise, you’re overloading your chest and shoulders with an unnatural movement over and over again. While you are doing this, the rest of your body is doing nothing. It might as well be lying in bed. Does this make any sense? If you want to be strong and healthy, you should exercise like gymnasts and animals do in the wild. Always exercise your body as a whole, using nothing but your own bodyweight. When you exercise naturally, not only will you avoid injuries like the above, but you will become stronger and healthier too. If you are a complete beginner, wall pushups are a great place to start. Once you can do the three variations I offer here with ease, you can move onto the more advanced exercises with confidence. This is a tough exercise that will work both your chest and legs. It is unusual, but if you want results, nothing beats training like a bear. Hindu Pushups are one of the best bodyweight exercises you can do. Not only do they work the chest, but your back, shoulders, and arms as well. Try it out and see what I mean. This eBook is filled with bodyweight exercises that will not only work your chest, but your entire body as well. Do you just want to look lean, strong, and healthy, or do you actually want to BE lean, strong, and healthy. If you prefer BEING to just LOOKING, my book of natural bodyweight exercises will get you there. In this eBook, I outline a series of exercises that are actually based on animal movements. If you like exercises like the bear crawl, you'll love what's in this book.